Moving along through the summer, our next major flowering plant is pale purple coneflower (Echinacea pallida). This attractive plant is popular in prairie plantings because of its colorful flowers. Also, it offers a nice contrast to the many yellow-colored flowers that are so common in the summer flora. In the past week, pale purple coneflower has come into its flowering peak, and we are now seeing it all over Pleasant Valley Conservancy. Although generally considered a prairie plant, we do find this in the more open parts of our savannas. Pale purple coneflower is often confused with another species, Echinacea purpurea, whose flower color is much more intense and whose leaves are much wider. This latter species is not considered native to Wisconsin, although it was planted extensively at the U.W. Madison Arboretum where it is now widespread in the Curtis Prairie. Purists now forbid its use in prairie mixes for planting Wisconsin prairies. 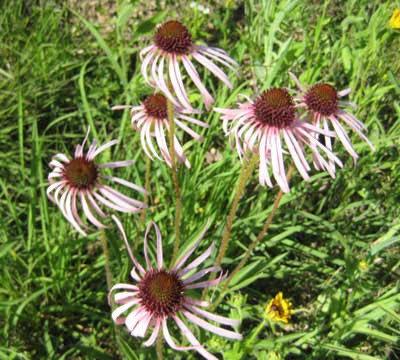 Pale purple coneflower is State listed as "Threatened" and is found in only a few Wisconsin counties. However, it grows readily in planted prairies and is becoming widespread. All of the pale purple coneflower at Pleasant Valley Conservancy was planted. I have seen it growing all over in planted prairies but only once in its native state, on the south-facing slope at Swamplover's Ice-Age Trail preserve. Here it was unknown before the hillside was cleared of invasive brush and burned, after which it flourished. Presumably this remnant population had managed to hang on in a suppressed condition through quite a few years of site degradation. 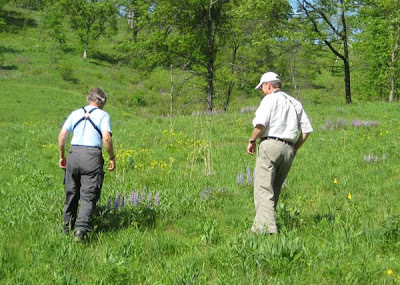 Ted Cochrane is the local expert on the Wisconsin flora. 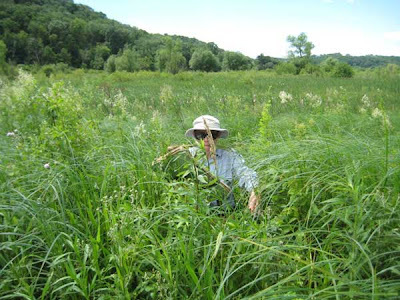 He has been co-author on two important books, one the Atlas of Wisconsin Prairie and Savanna Plants and the other a Checklist of the Wisconsin Flora. He has also written a colorful and entertaining book on wildflowers of the U.W. Madison Arboretum. Ted is Senior Curator at the U.W. Madison Herbarium and is one of the guiding spirits behind that organization's great web site. Yesterday Kathie and I were able to capture Ted at a fleeting moment for an extensive tour of our wetland. Some of the most difficult plants we have to identify are the wetland sedges and grasses, and Ted is superb at spotting these and putting names on them. Our foray was a little damp, as we were still feeling a bit of effect from the heavy rain storms of earlier in June. But the plants had bounced back quickly from being flooded, and were flourishing. We were able to cover quite a bit of territory and our species check list for Pleasant Valley Conservancy grew a bit. In all, a great day! In my professional life I was a microbial ecologist and spent over 40 years doing field work in the great outdoors. For ten years I had a major research project in Yellowstone National Park which got me outside in all kinds of weather. This was followed by ten years working on Wisconsin lakes. Through the years I learned to adapt to all kinds of outdoors situations. When Kathie and I began restoration work in southern Wisconsin, we had to learn of a new set of hazards. Some of these are minor, even trivial, whereas others are more than mere annoyances. Most people learn to deal with these things, and everyone has their own solutions. The ones given here are those that I have found best. 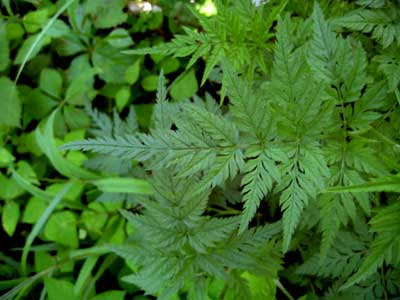 There are two species of poisonous plants that one confronts on an almost daily basis: poison ivy and wild parsnip. We have a lot of poison ivy at Pleasant Valley Conservancy, and this year seems to be a boom year. This is mostly a hazard in our savanna areas, and it is often found along paths and service roads, but I have seen big patches among tick trefoil in savannas. Since poison ivy and tick trefoil both have tri-partite leaves, they can be mixed up if you aren't paying attention. Often when pulling weeds such as sweet clover, you see a tall outlier just crying to be pulled. You wade into it, grab it at the base of the stem, and pull. Oops! It was right next to a patch of poison ivy. Did I get any on me? The solution to this problem, as it is for most of the hazards mentioned here, is in one's dress code: work gloves, long sleeves, long pants, and sturdy work shoes. Kathie can't seem to stand long sleeves so she relies on her skill at instantly recognizing poison ivy and carefully avoiding it. My plant ID skills are not as good as hers, so I insist on long sleeves. A cloth hat is also important as a sunscreen and to keep ticks away from the head. Wild parsnip seems to be a major hazard in our part of Wisconsin. It dominates the road sides and is often seen in huge amounts in old fields. Although we have essentially eradicated this plant from Pleasant Valley Conservancy, there is always a nearby seed source so we must deal with it every year. Wild parsnip produces a chemical that is photodynamic and causes blisters on the skin when exposed to light. A major case of wild parsnip toxicity can be more than an annoyance. I never touch a parsnip plant without being gloved and wearing a long-sleeved shirt. 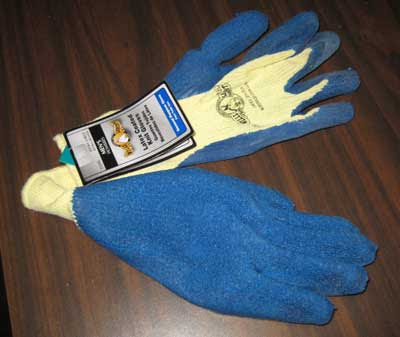 Work gloves are sold virtually everywhere and are essential for field work. You cannot even venture into a prairie or savanna without wearing work gloves! I'm not talking about gloves for warmth, or for running prescribed burns, but for summer restoration work. 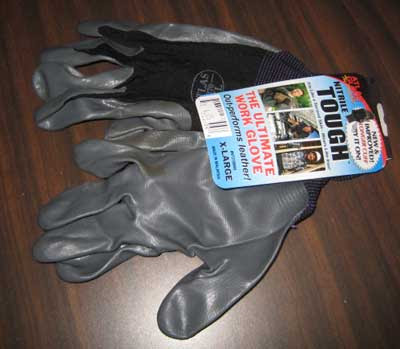 Through the years, I have tried all sorts of work gloves, and have settled on gloves that have a cloth back (for coolness) and a waterproof durable front of rubber or nitrile. A long cuff is important to keep plant toxins off the wrist area. There are lots of brands of these gloves; the photos here are mainly to illustrate the type of glove rather than its maker. The upper photo is of the really lightweight gloves that are best for summer work. The gloves in the lower photo have a better gripping surface and thus are preferable for handpulling sweet clover, wild parsnip, etc. In the animal world, there are two species that need special attention: chiggers and ticks. Chiggers are tiny, virtually invisible mites that are able to cause considerable annoyance. The larvae hang out on grass and attach to whatever passes by, including humans. They don't actually bite or burrow into the skin, but they inject a chemical which contains an enzyme which breaks down skin tissue, creating food materials for the larvae. After about 4 days the chigger larva drops off, leaving a red welt that itches terribly. They generally become concentrated in areas of the body where clothing is tight, such as below the belt. We find chiggers mainly in the warmer time of year. The solution to chiggers is to use a repellent such as DEET (N,N-diethyl-m-toluamide), sold by various trade names such as OFF. Check the label for the active ingredient. Before going into the field in the morning, I spray around my ankles with a generous amount of DEET. (Some people use flowers of sulfur, or tuck there pants under their socks.) Since I have started using DEET, I have had no trouble with chiggers. Ticks, especially deer ticks, are carriers of a bacterium that causes lyme disease, a major, potentially very serious infection that untreated can even be fatal. Since lyme disease is endemic in our area, we take ticks seriously. Ticks are 8-legged arthropods that are blood feeders. They drop onto the body from trees or vegetation and wander around until they find some bare skin where they can attach. Once they get firmly attached they are difficult to remove. A well embedded tick may require surgical removal. In the early stages of attachment, a special tick tweezers is the best solution. Again, long sleeves and long pants are helpful tick prevention measures, but the most important thing is to examine the body from head to toe after a day in the field. Some people seem to be more tick-attractive than others. I generally find a few ticks each year that have managed to attach to my skin, and perhaps a dozen others found walking upon clothing. DEET works as a repellent. I realize that in mid summer long sleeves and work gloves are a nuisance, but unless you have a skin like an alligator, they really are essential. Through the years I have been doing restoration work I have found that I have gotten used to these encumbrances. After a few hours I don't even notice them, although I will admit that it is sheer pleasure at the end of a work day to take off the gloves and roll up the sleeves! The weather is getting hot and we can now start to think about summer. One of our earliest summer prairie plants, ox-eye (or false) sunflower (Heliopsis helianthoides), is now starting to flower. This plant is the forerunner of a whole series of prairie forbs that will make our prairie plantings so attractive in summer. Also, this species is also present in most of our savannas, where its color will provide a welcome contrast to the drabber savanna forbs. According to Cochrane and Iltis, this species is fairly shade tolerant and hence may be more likely a savanna than prairie species. However, in our mesic prairies (Pocket, Valley, and Crane) it is now quite common and very showy. As its name implies, it is not a "true" sunflower (genus Helianthus). 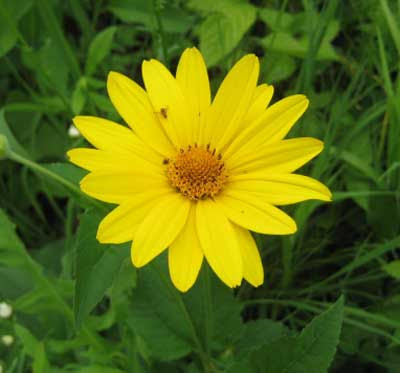 One simple way to distinguish Heliopsis is that its ray flowers are fertile, whereas those of Helianthus are not. Pull one of the ray flowers off and look for the stamen and pistil attached, a condition not seen in a true sunflower. Although the ray flowers are fertile, most of the seeds are produced by the central disk flowers. This is a good butterfly plant. Also, its seeds are a prime food source for songbirds in winter. 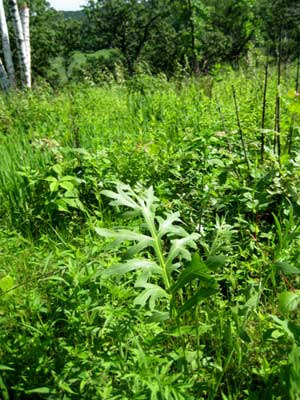 It is sometimes planted in food plots for attracting birds, deer, and other wildlife. However, at Pleasant Valley Conservancy we have used it only as a minor part of a seed mix for planting mesic prairies and savannas. Ox-eye sunflower has a long flowering period, so we should be seeing individual plants flowering over the next month or so. Google Street View provides an on-the-ground view of a street and its surroundings. It works in a lot of areas of the United States, including, apparently, all of Dane County. It can be used to "experience" a bit of Pleasant Valley Conservancy without actually being there. Click on the Street View tab and a window opens up to a view of Pleasant Valley Road with a stripe down the middle. Put your mouse on this stripe and "drive" along. At any point you can get a 360 degree view by just rotating the image with your mouse. The view is, of course, only a single shot in time. From the vegetation and other cues it appears to be late summer/early fall, perhaps in 2007. You can see our barn and cabin, the wetland, the south slope with its little bluestem stand, and many other items. You can also move along the road in either direction. When you reach the next road junction, you can turn and proceed. If you want to see our south-facing slope and its prairie remnants from a distance, "drive" west to County F, then south on County F for a ways before doing a 360. If you get tired of the scenery and you live in Dane County, you can type in your own address and see your house and yard. How do they do it? Google has a bunch of vans with cameras mounted on top that tool the roads and takes the photos. Presumably GPS is used to connect the images to the maps. My daughter used to live in Mountain View, CA, the headquarters of Google, and saw the first van in action. The camera was mounted on a pole on the roof. Do a Wikipedia search for "Google Street View" to get a detailed explanation. I'm not sure whether Google Street View is just a "stunt", or whether it can be really useful. I have used it to check up on the homes that both of my adult children are living in (Atlanta and Santa Fe). This is better than a snapshot, since you can move around and get the environmental context of a site. Most of the locations where Google Street View has been acquired are urban areas, but a surprising amount of rural Wisconsin has been done. For instance, County F and Mounds View Road, where the Prairie Enthusiasts has some active work, can be viewed. The main roads in Iowa County have been done, as well as the communities of Barneveld, Ridgeway, and Dodgeville. Any Google Map image that shows a blue line when Street View is active can be viewed on the ground. Technology in action! 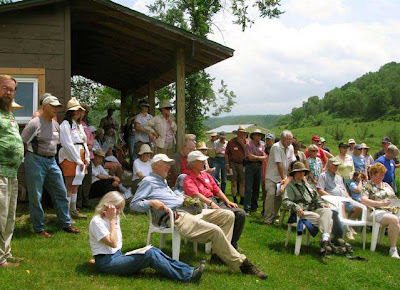 From Joan I learned about the Wisconsin Butterfly web site, which is an outstanding example of the kind of web site that builds community by encouraging folks to contribute photos, sightings, and other observations about butterflies. Actually, it isn't restricted to butterflies, as they also feature dragonflies and damselflies. After clicking around on this site awhile, I discovered Joan's post of their visit to Pleasant Valley Conservancy. This has a list of all the butterflies they saw on Saturday. Check it out. Yesterday Kathie and I toured an interesting private savanna site near Rush Creek State Natural Area. This SNA is part of the blufflands on the Mississippi River. The tour was lead by Armund Bartz, a DNR Conservation Biologist who works out of the La Crosse office. 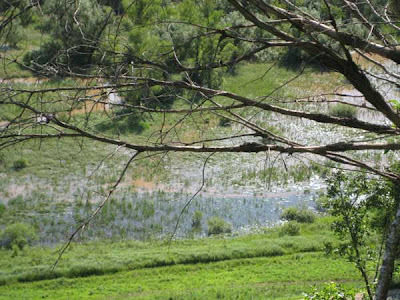 Rush Creek is a large State Natural Area with imposing high prairie bluffs facing the Mississippi River. The site we toured was a private site contiguous with Rush Creek that the landowner has been restoring for the past ten years. Although small (less than 50 acres) this was a high quality site with open-oak woodlands and some open-grown oaks on the high bluff. It has a very diverse understory of savanna and woodland species, including two that I was particularly interested in seeing, upland boneset (Eupatorium sessilifolium) and purple milkweed (Asclepias purpurascens). These are two species that we have been especially studying at Pleasant Valley Conservancy. 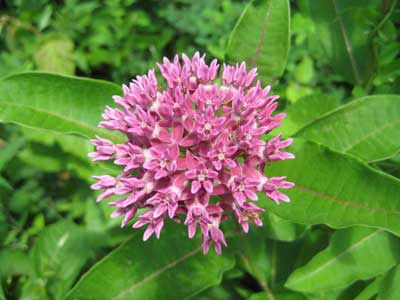 Purple milkweed is an endangered species that is found only in the southern part of Wisconsin. Although we have quite a few plants at Pleasant Valley Conservancy, scattered across our savannas, the habitat they require, deep-soil sites with dappled shade, is not common these days. Since I have been doing research on the conservation of this species, I try to visit any site where it is present. The site we visited yesterday had several fine populations, with a lot of plants in full bloom. They looked identical to ours. However, unless they are flowering, positive identification is uncertain, as they can be confused with common milkweed, Asclepias syriaca. In fact, there is some thought that these two species might hybridize, although there is no experimental data to support this. Upland boneset is a Special Concern species in Wisconsin. It is another species that requires open-shade sites, such as open oak woods or savannas. It is also found only in southern Wisconsin and has a very high coefficient of conservatism (9). At Pleasant Valley Conservancy we initially had only a single patch, and have been working to establish it in other sites. We have had poor success planting seed, probably because seed viability is low. So we have been raising plants in the greenhouse (from the few seeds we have been able to get to germinate) and transplanting them to suitable sites on the Conservancy. We have had good success with transplants, but so far no evidence of spread. The Rush Creek savanna, on the other hand, has lots of this species, growing in many sites across the steep hillside. It took a bit of experience to spot them, however, since woodland sunflower plants were widespread and superficially look similar. 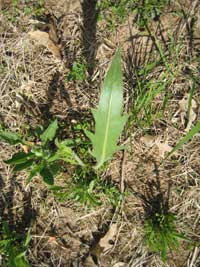 However, upland boneset has a distinctive sessile leaf structure that cannot be mistaken for anything else (see photo here). It was too early to see flowers. After touring through the savanna areas we came onto a dry rocky prairie, the type that is so characteristic of the Mississippi River bluffs. There we saw the usual array of dry-prairie species, such as short green milkweed, lead plant, little blue stem, silky aster, bird's foot violet, etc. This very steep south-facing slope was a challenge to surmount, but when we reached the top we had a fine distant view of the River. The vertical elevation here is over 400 feet. Those with better ears than mine heard a cerulean warbler, a species that breeds mainly where there are large areas of woods. The Rush Creek field trip was really enjoyable. The participants were knowledgeable and interested, and the leader knew the site very well. In all, a great day, and well worth the 2.5 hour drive from Madison! Glade mallow (Napaea dioica), a handsome plant of wet prairies and marshes, is the only plant endemic to the north-central United States. On the state species list for Wisconsin, it is listed as of "special concern." Even in the states where it is found, it is rare or threatened. In Wisconsin it is found only in counties in western and southern Wisconsin. There was already a small glade mallow population at Pleasant Valley Conservancy when we began restoration. As a result of our work creating the Crane Prairie, we now have quite a lot more of this interesting species. We had a good supply of seed (collected locally) when we planted the Crane Prairie in December 2005, which probably explains its present abundance. Now, in its third growing season, we have quite a substantial number of plants, mostly in the wetter part of the prairie. I have been monitoring them since spring and just now they are beginning to flower. Glade mallow is one of a small fraction of the vascular plant flora that is dioecious, having males and females on separate plants. Both sexes seem to occur in about equal proportions. According to Cochrane and Iltis, this species grows well in sunny gardens. Because of its tall size it makes a handsome backdrop to a perennial garden. At one time, the largest population of glade mallow in Wisconsin was found in ditches along U.S. Highway 14 between Cross Plains and Black Earth. Unfortunately, a high-power transmission line also ran along this same area and due to error or ignorance (or both), a contractor hired by the transmission company killed most of the glade mallow plants by spraying the area with the herbicide Tordon. Fortuitously, my wife Kathie was driving past when this spraying operation was in progress. Appalled at what she saw, she waded out into the ditch and was able to convince the contractor to stop further spraying. Her efforts resulted in saving about 30% of this outstanding species. A number of people, including the Wisconsin Department of Transportation, may have learned a lesson here, although whether it will lead to better management of native plant species along our highways is an open question. Now is wood lily (Lilium philadelphicum) time, although there are few places where you can see this handsome prairie plant . Last evening Kathie and I led our annual field trip to Black Earth Rettenmund Prairie, famous among the cognoscenti for its outstanding display. I'm not sure why this prairie plant is called a "wood" lily. I've seen a few at the edges of woods, but generally it is found in dry prairies. It is one of those species that deer love to eat, and if you have any significant deer population you probably have very few wood lilies. One of the reasons that Rettenmund may be such a great wood lily site is that deer are never found there. This tiny (16 acres) prairie, a prime Prairie Enthusiasts remnant, sits in the middle of a large open agricultural area, with a major county highway providing almost constant traffic. There is no cover here for deer, which may be what has saved it. Whatever the reason, the middle of June is prime time to visit this great State Natural Area. 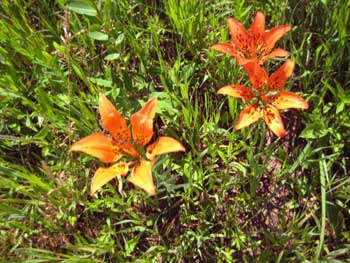 Although once widespread, habitat destruction has virtually extirpated wood lilies from many states. It is listed as endangered or threatened in many states. In Wisconsin it has a coefficient of conservatism of 9, (on a scale of 0 to 10), emphasizing its rarity and restricted habitat range. If plants are found they should never be disturbed. Kathie has been raising wood lilies from seed for a few years now. This is an exercise in patience. The seeds germinate well but the first year send up only a single tiny leaf. The second year there may be two leaves. The third year a few more. What the plant is doing is building a bulb, and flowering does not occur until this bulb is well formed. At Pleasant Valley Conservancy, the only wood lilies that she has been able to maintain have been carefully placed inside wire cages where the deer can't get to them. This isn't the most natural way to cultivate a species, which makes the Rettenmund Prairie population even more thrilling to see. The display at Rettenmund should be going on for the next week or so. Get out and see it. Directions can be found at this link. 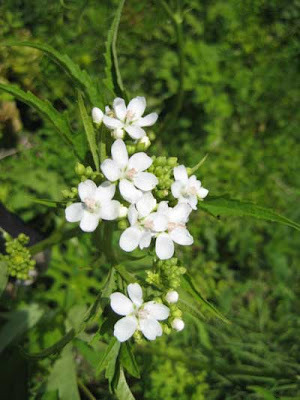 Japanese hedge parsley (Torilis japonica) is one of the so-called emerging weeds for southern Wisconsin. Unfortunately, it has been at Pleasant Valley Conservancy ever since we started restoration work. I'm not sure whether it has been spreading or whether we have just learned to recognize it better, but it seems to be more widespread. The photo to the left, taken yesterday in a fairly shady savanna, shows how difficult it can be to spot when just in the vegetative state. Hedge parsley is what is called a "winter annual", which means that its seeds start to grow the same year they are formed, overwinter in a vegetative stage, and then flower the following summer. It is found mainly in shadier areas. It is a member of the carrot family, and when small its leaves can be mistaken for those of Queen Anne's lace, another exotic invasive plant. The first collections at the U.W. Madison Herbarium were made in Walworth County (on the Illinois border) in 1976. My dear friend Olive Thomson made the first collection in Dane County in 1982. It is now found in several counties bordering Illinois and as far north as Waupaca and Manitowoc Counties. Unless a concerted effort to control it is carried out, it will undoubtedly spread widely across southern and central Wisconsin. Unless one has a large infestation, hand pulling is about the only control method, although I did find that spraying the "winter" plants with Roundup in late November or early December worked. However, in the wooded areas where it is mostly found, it is covered with leaves that time of year and hence hard to spray effectively. Fortunately, it pulls very easily, lots easier than wild parsnip or sweet clover, for instance. Because of its delicate flowers, it is fairly hard to detect even in mid summer when it is in full flower. We have been keeping notes on where we have found it, and use those notes to keep on top of our main infestation sites. I haven't found any data on seed bank conditions, or on how long the seeds can be expected to persist. So far, we still find it in areas where we first found it ten years ago, suggesting that the seeds may have considerable longevity. Hedge parsley is undoubtedly lots more common in southern Wisconsin than suspected. I have seen it all over, including one very serious infestation that was a long distance from any nearby roads. Nick Faessler of the Prairie Bluff Chapter of the Prairie Enthusiasts has designed a clever shovel for digging wild parsnip, sweet clover, or any other herbaceous weed. These are sold by the Prairie Enthusiasts at a nominal cost, and are well worth it. The interns at Pleasant Valley Conservancy each has been issued a predator, courtesy of Madison Audubon, and they are making great use of them now. Faessler buys small shovels and cuts down the blade so that it has a sharp narrow cutting edge. He also turns the "D" handle 90 degrees to make the shovel easier to handle. You could make your own if you are handy with tools (an angle grinder will take care of the cutting), but the Prairie Enthusiasts sells these as a fund raiser. We own 6 of these at Pleasant Valley Conservancy, and make a lot of use of them. Some of our volunteers even own their own. The late spring prairie flora is not as colorful as the summer flora, but there are some nice species. Generally, these species march in sequence across the calendar. Two weeks ago it was golden Alexanders (Zizia spp. ), which was very prominent in virtually all our prairies, as well as in the savannas. Following quickly on Zizia was lupine (Lupinus biennis), whose blue flowers provided a nice contrast to the Zizia. 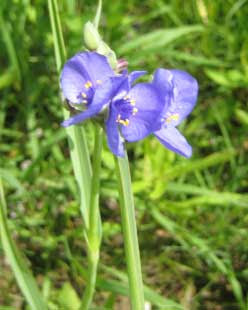 Now it is spiderwort (Tradescantia ohiensis), another species that grows in all our prairies as well as the savannas. Since it flowers fairly early, it is another candidate for planting as soon as the seeds are ready to collect. When we started restoration, the only site we had with spiderwort was the steep road-cut of Pleasant Valley Road. We collected seed there and threw it up the bank, to get it spread farther out. We also found a railroad that had a huge amount growing in its ballast (spiderwort seems to grow well even on sterile railroad ballast). We dried the seed we collected there and saved it for fall planting in our seed mixes. Gradually we were able to spread spiderwort across the Conservancy. Now we have it virtually everywhere. Even though it is not a wetland plant, today I even saw a flowering stalk in our sedge meadow. Incidentally, drying spiderwort seeds is a challenge. The seed pods hold lots of moisture, and getting rid of all this water is a difficult task. We have found it best to spread out the pods on plastic sleds and put them in a heated room. It might seem strange to need heat in summer, but even then, the seeds usually take four or five days to dry, sometime longer. Because of its colorful blooms, this is a great species to work with. However, one drawback is that the flowers usually close about mid day so that the best floral displays are in the morning. When spiderwort is in bloom, getting up early is really worth it! What comes after spiderwort in the color sequence? Ox-eye sunflower, Heliopsis helianthoides, which is just starting to bloom. Bird's foot violet (Viola pedata) is one of those great early spring prairie plants. (See my post of May 17.) On one of our remnants we have a nice large patch that has been there for many years. It is an ideal place to collect bird's foot violet seeds. However, collecting these violet seeds is an exercise in frustration. The tiny seed pods remain closed until the seeds are ripe, at which time the pods open and the seeds are shot into the air. The trick is to catch them just "before" they open. But when will that be? Today the seed pods were almost 90% open! However, there were so many plants that Kathie was able to make a good haul. The photo here shows a seed pod that had opened but for some reason had not lost its seeds yet. A number of the other pods had not opened but should do so overnight in the dry paper bag they are being stored in. We should have a reasonable amount of seed to plant on Toby's or the Ridge Prairie, both dry site prairies. When should you plant bird's foot violet seeds? It seems reasonable that they should be planted right away. After all, that is what is happening right now in nature. So sometime in the next few days we will find some good locations in these two prairies to put the seeds down. We have raised these violets in the greenhouse. The seeds germinate well, the plants transplant well, and they become easily established in new areas. In fact, they often flower the first year they are transplanted. When we began restoring our oak savannas at Pleasant Valley Conservancy, we had to deal with a huge amount of buckthorn (Rhamnus cathartica). We got rid of it, by brush cutter, chain saw, and Garlon 4 herbicide treatment (basal bark), and spent three or four years getting an herbaceous understory established in face of buckthorn allelopathy (the critter produces a potent toxin that stops the growth of other species). While we were doing this work, I did not stop to ask why the buckthorn infestation was much worse in our savannas than in our oak woods or prairie remnants. Recently I ran across a paper by Apfelbaum and Haney, written in 1987, that explains the relationship pretty well. 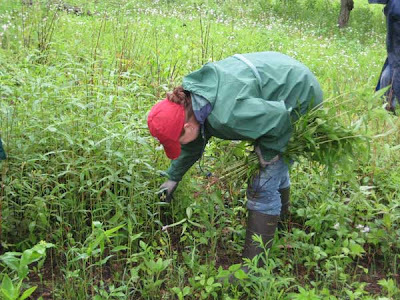 These researchers did quantitative measurements of buckthorn density in different kinds of oak habitats, from close oak woods to virtually open prairie. They found that buckthorn density was highest when the oak canopy had about 60-70% cover, was much less at low canopy densities, and was almost nonexistent in heavily shaded oak woods. These data fit nicely with our experience carrying out restoration work on oak savannas. Getting rid of buckthorn in the oak woods has been relatively simple. All it took was a program to carry out basal bark treatment with Garlon 4 in a single winter. The buckthorn were scattered and relatively easy to treat. On the other hand, our oak savannas had very dense buckthorn stands. It took lots of effort to cut all the buckthorn, treat all the cut stems with herbicide, and build the large brush piles needed to get rid of all the biomass. Another consequence of the development of these dense buckthorn stands is that the herbaceous ground layer is completely eliminated. This is probably partly because of allelopathy and partly because of the dense shade created by the buckthorn shrubs. The compass plant, Silphium laciniatum, is one of the signature species of a tall grass prairie. It is featured in the logo of The Prairie Enthusiasts, emphasizing its iconic nature. Its modal habitat is the mesic prairie, although it is also found on wet- and dry-mesic sites. It is only absent on really dry sites, such as steep south-facing hillsides ("goat" prairies). Compass plants are very deep-rooted species and generally take five or six years to become well enough established to flower. Their first few years in a new prairie planting are occupied with sending down deep roots. 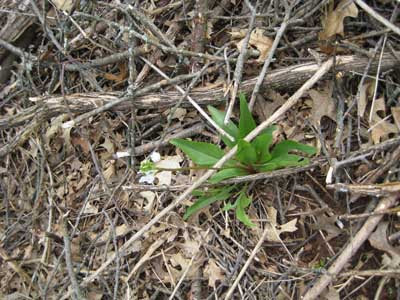 In the first or second growing season only one or two leaves are visible. 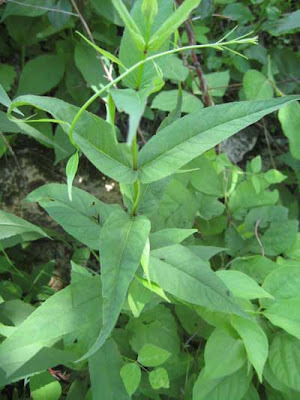 However, the leaves are very characteristic and even a single leaf is easy to recognize in a new planting (see photo). Compass plants are very sensitive to grazing and they are one of the first plants to disappear when a prairie pasture is opened to cattle. We have been planting compass plants at Pleasant Valley Conservancy since we first began restoration. Planted prairies such as Toby's Prairie and (especially) the Pocket Prairie have now well-established populations. In addition, we have included compass plant seeds in the dry-mesic mix we have been using in the more open areas of our savannas. Just this year, for the first time, I have started to see compass plants in the open area of one of our bur oak savannas (see photo). It is possible that these plants have been here for a few years but were hidden under the tall vegetation that thrives in these savannas. So far I have seen two plants in this savanna, although a careful search might uncover more. It may take a few years yet before they will flower. The past week has been one for the ages. Not quite up to Biblical levels, but still a record amount of rain. Two major rain storms within a few days of each other occurred, sending rivers from their banks, tearing out highways, and flooding towns. At Pleasant Valley Conservancy we had over 6 inches of rain, mostly coming in heavy, heavy rainstorms. I was able to watch the rain event on Sunday, June 8, 2008, since Kathie and I were scheduled to run a field trip for the Natural Resources Foundation, and the starting time for the trip was a few minutes before the heavens opened up for the second time. We obviously could not hike, so we met in the barn and had a lecture until the rains stopped. While lecturing with the barn door open I was able to watch the sheets of rain descend. For a time, it was impossible to even see the sedge meadow that was about 10 feet from the barn door. That's rain! The total rain in this one event, which lasted about an hour, was 3 inches. Pleasant Valley Creek overflowed its banks and spread muddy water over our wetland. Who knows what happened to the sandhill crane nest that was nearby. Two days later the wetland was still full of water, and it was possible to see where the spring-fed creek that rises on our property met the muddy water from the storm event. The photo shows the border between these two streams. Let's hope we can return to a more normal weather pattern. 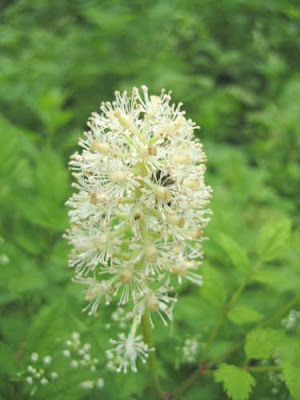 White baneberry (Actaea alba), often called "doll's eyes", is now in bloom. This is not as common as red baneberry (Actaea rubra), which has been blooming for some time now. We have white baneberry scattered along the edges of our north woods, but we have a fairly large patch near the top of Unit 18, a white/bur oak savanna that we have been restoring for some years now and have high hopes will eventually be in good shape. We did not plant the white baneberry, and it was probably there before restoration. When we started restoration on this unit it was choked with black walnuts as well as honeysuckles and was very shady. Clearing was done in the winter of 2000-2001 and we have been working on this unit ever since. I assume that the white baneberry was released once we removed the deep shade. We have seen it here for at least four years but this year it seems especially lush. 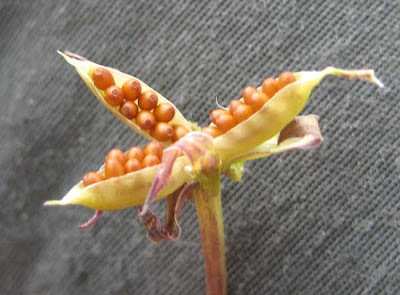 We'll try to keep an eye on this species and collect the seeds when they are ready, sometime around the end of August. There are quite a few other locations at Pleasant Valley Conservancy where this species would grow well! Saturday afternoon, June 7, 2008, the Wisconsin Department of Natural Resources (WDNR) and the Prairie Enthusiasts (TPE) participated in the dedication of Pleasant Valley Conservancy State Natural Area. Despite the threatening weather, over 100 people attended. The five field trips were also well attended, but somewhat truncated by late afternoon rain storms. At that time, everyone gathered in the barn for refreshments and conversation. It was a great day and Kathie and I appreciate all those who attended. Thanks to Evanne Hunt, President of TPE, Signe Holtz, Director of the WDNR Bureau of Endangered Resources, Rich Henderson, President of the Empire-Sauk Chapter of TPE, and Darcy Kind, WDNR, for their kind words, those who led field trips, and all those who attended. I re-read some of the posts I made last January and discovered that one of my predictions was wrong. At that time our contractor was clearing the East Basin of all the trees and brush, returning it to its 1937 state (as determined by the air photo from that year). I commented that once the 4.2 acre site was cleared, we were planning to leave it and see what came up before we started restoring the herbaceous layer. In my January 2, 2008 post I predicted that nothing good would come up. I commented that the site had probably been grazed and all the prairie plants would be gone. I opined that because there would be nothing good, we would probably spray the whole site with glyphosate and start over. Well, as two of my later posts stated, we did find lots of good plants in this basin, even though the site had been shaded by large trees and brush for many years. Shooting stars were especially prolific (see photo), but there were many other "good" species. This made me conclude that the site had probably not been grazed, which makes sense, because this isolated unit was far from the barn, and access was blocked by neighbor's land. So now I have to rethink what we will do with this unit. We will obviously have to plant it with seeds collected elsewhere on the Conservancy, which means we must start to formulate a seed-collecting protocol, making sure we get all the needed species when they are available. However, we won't have seeds for most of the species we will be planting until November. In the meantime, we must continue our plan of spraying all of the invasive plants as they appear. So we will probably be back two or three times this summer with backpack sprayers. Frankly, I am pleased my prediction was wrong. In retrospect, I understand why I was wrong. Now we can move ahead with restoration of this interesting area. 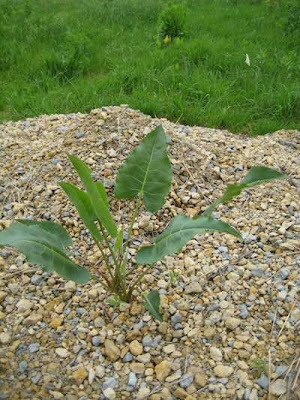 The photo shows a prairie dock plant making its way up through a pile of gravel. Last November we regraded our service road, and it took quite a few loads of gravel. One of the gravel trucks was a little overexcited and dumped some gravel onto the edge of the Pocket Prairie. We figured that whatever prairie species were underneath the gravel were gone for good. We did not count on the power of the prairie dock plant! Of course, prairie dock has very deep roots, so it does not need to get nutrients from the soil surface. And this specimen does not have to worry about competition from weeds, etc. Ever since we began restoration of our oak savannas we have been plagued with the spread of woodland sunflower (Helianthus divaricatus and several other species). It took us a while to realize what was going on here. After all, this is a native plant, and one that forms pretty yellow flowers. What's to dislike? Woodland sunflower is a clonal species, spreading especially rapidly by means of underground runners (rhizomes). In this regard, it resembles Canadian goldenrod, another native species which is also a pest. When we first started to see increasing amounts of woodland sunflower, we thought it was a benign plant, and would gradually disappear when it was exposed to full sunlight. Unfortunately, this has not been the case. In fact, in 2007 I saw a clone spread across a mowed fire break into one of our planted prairies and displace the native species. Also, in open woodlands, such as our oak savannas, it quickly becomes widespread. In 2007 we started controlling this species by spraying medium-sized patches with clopyralid (Transline). This herbicide is quite effective, although it hits most broad-leaved species. I also did some experiments to show that mowing this species will not eliminate it, whereas hand-pulling will. Although exceedingly labor intensive, hand-pulling all the plants in a clone should eliminate it. This year we decided to have our 5-person intern crew hand-pull some larger clones to see how the other species would respond. We were pleased to see that within the sunflower clone there were quite a few "good" species, including flowering spurge, tick trefoil, purple milkweed (yes! ), showy goldenrod, etc. etc. Obviously spraying would have eliminated these "good" broad-leafed plants as well. Another consideration: rather than wait for a clone to take over and then eliminate it, why not nip it in the bud? In this way I hand-pulled the scattered sunflower plants that had cropped up within a nice patch of yellow pimpernel (Taenidia integrifolium), a great savanna species that is not especially common in our area. Obviously, this is the way to go, although it requires careful observation to detect the few plants that need pulling. Later, if they flower, it should be easier to spot them. I'd love to hear from others who have had trouble in their savanna restorations with woodland sunflower. Wild lupine (Lupinus perennis) is a delightful early prairie plant. It grows best on drier, sandier sites. About eight years we were given five bags of lupine chaff remaining from a major seed cleaning operation. Four or five volunteers were given parts of this chaff and told to throw out the seed wherever they wanted to. In addition, Kathie threw some seed in two small areas of the Pocket Prairie that are unusually sandy. It was these latter two places that we first saw lupine flowers. 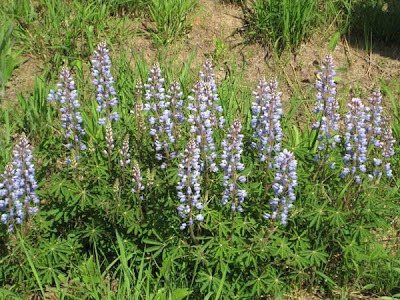 In the subsequent years lupine has been seen in several other areas, including Toby's Prairie and several more open savannas. Also, the original patches in the Pocket Prairie have continued to spread. Lupine sets seed around the middle of June but they are hard to collect because as soon as the seeds are ripe, the pods burst and the seeds are shot away. Because of this process, lupine spreads readily, colonizing new areas that have the right growing conditions. I have seen a private roadside of a half mile in length which is almost solid lupine. This roadside had been planted about 15 years ago with seeds from a single packet purchased from a prairie nursery. The conditions were obviously favorable for growth and spread! Seed collecting lore says that you have to collect your lupine seed before the 4th of July. Our seed collecting chart says mid to late June. In the field, lupine plants start growing soon after the seeds are released. In line with this behavior, lupine is often seen in flower in first-year planted prairies. Lupine is the only known host for the endangered Karner blue butterfly and conservation efforts on lupine and Karner blues go hand in hand. We don't have enough sandy areas to support Karner blues, but we are still happy to have some areas where lupine thrives. I have described in other posts our work raising prairie and savanna plants in the greenhouse. On Thursday and Friday three of us planted about 170 of these plants at Pleasant Valley Conservancy. We have about 50 more to plant, and hope to have this work all finished in a few days. We use information from various books and manuals to decide where each species should be planted. The Cochrane/Iltis Atlas of Wisconsin Prairie and Savanna Plants is our main source, but we are finding the new book by Merel Black and Emmet J. Judziewicz on Wisconsin wildflowers also very useful. We also use our own experience from previous years, as well as our detailed knowledge of where these species are currently thriving (if at all) at the Conservancy. An important detail about transplanting into nature is that each plant must be placed in an area that can be easily reached for watering. Ten years ago, when we first started with transplants, we discovered that lugging large jugs of water up steep hills was not a good idea. We needed to have these plants close to our service road or utility vehicle lanes so that they could be watered quickly. In order to find the plants again, each year I set up a transplant database, using an Excel spreadsheet. 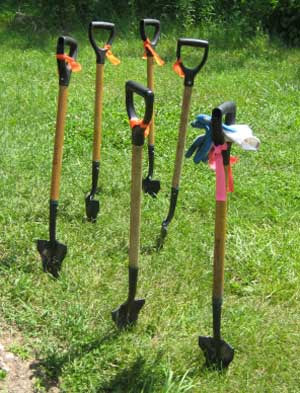 Each plant is given a number, and we usually plant in groups of three. The location is taken from a unit number in our management map. After all the plants are set out, I sort the Excel file by location, so that all plants at a given location can be watered together. Another minor but important point: we use a different color of flag for each year. Thus, 2006 plants have blue flags, 2007 have yellow flags, and 2008 have pink flags. Once these plants make it through the first season, we let them continue on their own without watering. About 70% of the 2006 plants that were still alive at the end of the season made it through to 2007. Soon we will be surveying these again to see how they are doing. I already know that a number of the purple milkweed plants raised from seeds and planted in 2006 are still thriving in 2008. A few are even showing flower buds. Transplants are a lot of work, and are not worth it for plants that develop readily from seed. We only raise special species.